This will prevent Dr. Sue from sending you messages, friend request or from viewing your profile. They will not be notified. Comments on discussion boards from them will be hidden by default. Sign in to Goodreads to learn more about Dr. Sue. I'm Frank Eakin of Eakin Films & Publishing, the producer of this audiobook. 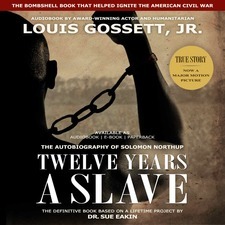 We are hopeful that AudioFile Magazine’s outstanding review of Louis Gossett, Jr.’s narration of TWELVE YEARS A SLAVE in early 2013 will be the first of many that will set the stage for a Grammy nomination: “...Gossett infuses the words with a quiet, seething power." Aside from being a world class performer with an Emmy for his role as Fiddler in ROOTS and an Oscar for OFFICER AND A GENTLEMAN, Lou’s passion for this story and the subject of human suffering drives his riveting performance. He has been a wonderful partner in this venture and his work comes from the heart. The story of Solomon Northup has a long history in my family. Originally published in 1853, the autobiography was lost to history by the early twentieth century, when a 12-year old avid reader in central Louisiana – the future Dr. Sue Eakin – reached upon the library shelf of a plantation home and discovered a dusty copy of the book that would determine her life's path. She went on write her master's thesis about Solomon’s story and after decades of research, produced the first authenticated edition of the book in 1968. In 2007, at the age of 88, she completed a final definitive edition with over 100 pages of additional fascinating information, never-before-published images and unique maps related to the story that will be released as an e-book and paperback on Amazon soon. This audiobook edition comes with an accompanying copyrighted custom map developed by Dr. Eakin that tracks the story and shows the plantation tracts owned by the slave masters mentioned in the narrative. For more info, including updates on the 2013 movie starring Brad Pitt, Paul Giamatti and Michael Fassbender (directed by Steve McQueen), check out our website, Facebook page, and Twitter feed. Also see our Facebook page for Eakin Films & Publishing and the title’s Wikipedia page. Whenever you see Dr. Sue Eakin’s name associated with a book or audiobook related to Solomon’s story, that’s us – and you’ll know that you’re buying a high quality product with Dr. Eakin’s lifetime of research and dedication behind it. ...more "
We’d love your help. Let us know what’s wrong with this preview of Twelve Years a Slave by Solomon Northup. Take a look at Dr. Sue’s Year in Books. The good, the bad, the long, the short—it’s all here.